Thousands of DIY crafters have worked Castle in the Air’s crepe paper flowers into their party decorations, and we’re so grateful to have been a part of the festivities. Now a group of our teachers has raised floral papercrafting to the next level, creating a crown with a classic design from modern materials. And since more is more, our friends at Honestly WTF have joined in the fun and made a lovely larger version for people who want to make an even grander statement at their next celebration. Our Waxed Orange Blossom Crepe Paper Crown is a new take on the waxed floral crowns worn and cherished by French brides beginning in the 1800s. Following the wedding the crown was often displayed in a Globe de Mariée, a glass dome holding symbolic objects which told the story of the bride and groom’s life together. Today, the crown can still be worn by brides, but also makes a delightful topper at any outdoor celebration. Like the original crowns, Castle in the Air’s version makes a perfect keepsake, since the paper blossoms are sealed with wax to firm them up. The crown includes dainty flowers and unopened buds and is simply delightful. 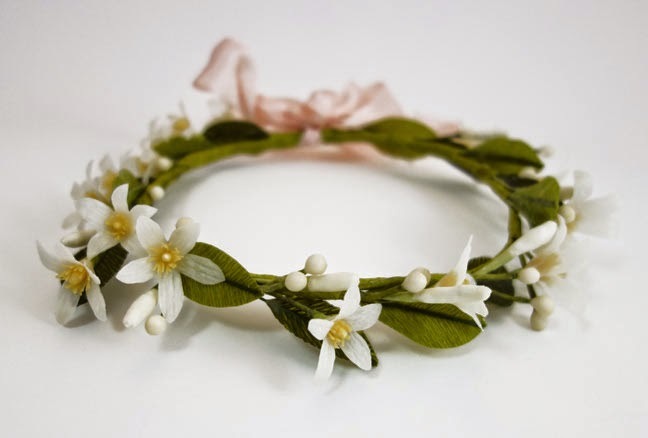 If you’d like to make your own, click over to the Online Shoppe to pick up your Waxed Orange Blossom Crown Kit and then watch as papercrafting teacher Lynn Dolan explains the tradition and takes you through the entire creation process in a YouTube tutorial. 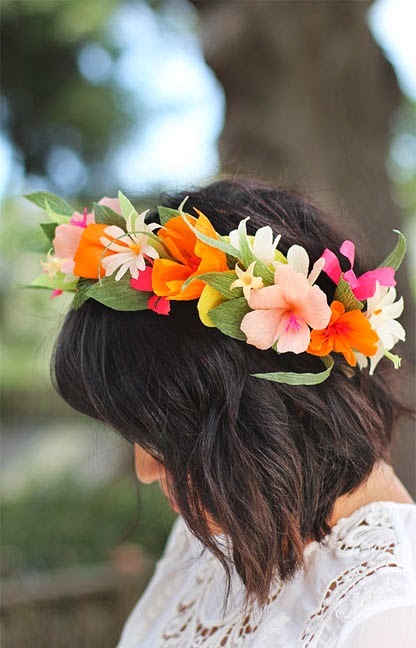 We knew Erica Chan Coffman at Honestly WTF would love the orange blossom crown, but we had no idea that she would dream up a spectacular new version to share with her readers. Erica’s crown features a colorful symphony of blossoms made at a slightly larger size, and the effect is stunning. She shares her technique and list of supplies (most of which are available in our kit) on her DIY Paper Flower Crown page, complete with sumptuous photos and step-by-step directions. Both crowns are so charming and distinct, and would be gorgeous displayed for years to come. All that’s left is for you to decide whether to make one, the other, or both!